Don’t miss the annual eagle celebration! LIVE Bald and Golden Eagles, early morning bird watching tour, educational presentation and more. 8-10am – “Early Birds” Field Trip: Join wildlife biologists for an early morning field trip searching for wild Bald Eagles and local waterfowl around Lake Mary. Personal transport required (carpooling encouraged). Weather permitting; in case of inclement weather field trip will be cancelled. Meeting location sent upon sign-up. If you would also like to attend one of the presentations at Willow Bend and view live eagles up close please make sure to sign up for one of the sessions below*. Field trip cost $10/participant, $35/family (2 adults + 3 kids) or FREE for Willow Bend Members***. Sign-up HERE. 10-11am – “Eaglets” Family Presentation: A family-focused interactive program especially designed for families with young children (ages 4-12 years old). Learn about and view LIVE eagles! Meet at Willow Bend Environmental Education Center, 703 E. Sawmill Rd, Flagstaff. This presentation is open to families with young children. Cost $10/participant, $35/family (2 adults + 3 kids) or FREE for Willow Bend Members***. Sign-up HERE. 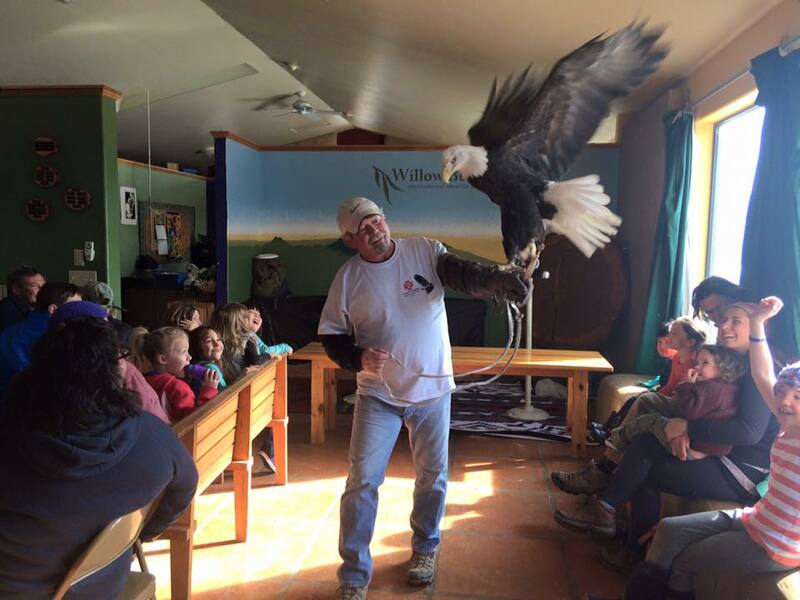 11:30am-12:30pm – “First Flight” Community Presentation 1: Learn about the incredible Bald Eagle from an Arizona Game and Fish biologist and view live eagles up close and in-person! Presentation is open to all ages**. Please note this is the same presentation as the 1pm Fully Fledged session. Please only sign up for one presentation. Cost $10/participant, $35/family (2 adults + 3 kids) or FREE for Willow Bend Members***. Sign-up HERE. 1-2:pm – “Fully Fledged” Community Presentation 2: Learn about the incredible Bald Eagle from an Arizona Game and Fish biologist and view live eagles up close and in-person! Presentation is open to all ages. Please note this is the same presentation as the 11:30am session. Please only sign up for one presentation. Cost $10/participant, $35/family (2 adults + 3 kids) or FREE for Willow Bend Members***. Sign-up HERE. *If signing up to the Eaglets presentation you will need to leave the field trip a little early to make the presentation on time. **Families with children are welcome to sign up for the First Flight and Fully Fledged sessions if the Eaglets sessions is full or if timing for later presentations works better for your schedule. However, please note that the afternoon sessions are not specifically designed for young children. ***Willow Bend membership includes up to 6 guests per family membership or 1 guest per individual membership.